A 29-year-old man driving a car with windows tinted too much, and a cover over the back license plate tinted so much that it was unreadable, was pulled over by a Darien police officer, resulting in the man’s arrest on multiple charges related to marijuana possession, police said. At 9:48 a.m., a police officer spotted a black Infiniti vehicle being driven west on Tokeneke Road, near its intersection with Cliff Avenue. Not only was there too much tinting on the vehicle, but the front license plate was missing. The officer pulled over the vehicle near Silver Lakes Drive. 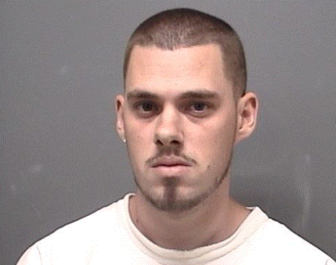 Arrest photo for Jason Pratt, 29, of Norwalk, charged Aug. 22. While talking with the driver, Jason Pratt of Yost Street in Norwalk, the officer smelled burnt marijuana and saw what seemed to be a “blunt” marijuana cigarette on the armrest of the driver’s door. Pratt said he had a medical marijuana permit card, which he showed the officer. The card had expired last October, but police later determined that he did have an up-to-date permit. Pratt also showed the officer two vials of marijuana. When asked if he had any other marijuana in the car, Pratt said he didn’t. But he did. Since, police said, Pratt appeared to be smoking marijuana in a public place, police decided to search the vehicle. 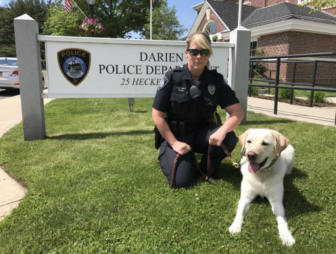 K-9 Kenny, a Darien police dog, was called to the scene to help with the search. Given that Pratt was using marijuana in a public place, in violation of his prescription card, further investigation was conducted. K-9 did a “free-air sniff” outside the vehicle and alerted police that there was a narcotic smell on the driver’s side and passenger’s side front doors. Based on that, police searched the car. Pratt was charged with possession of drug paraphernalia, not having a front license plate, illegal amount of tint on the car’s windows and having an unreadable license plate. He was also charged with “sale of marijuana,” according to the police announcement. Since there was nothing in the description of the incident that indicated police found him selling marijuana, Darienite.com asked a police spokesman about that. A Darien police officer with K-9 Kenny. The spokesman pointed to Section 21a-277 of the state statutes, which disallows (among other things) transporting marijuana for the purpose of selling or even giving it to someone else. It is unclear how transporting four ounces of marijuana and two cartridges of THC oil means Pratt was selling it rather than, for instance, having just bought it (although he was headed away from his home on Yost Street in Norwalk, not toward it). On the other hand, a man who said he was arrested with almost two dozen bags of marijuana in his apartment said the state Judicial Branch website labeled his crime “Sale of Controlled Substance” when he hadn’t done any such thing (he was charged in 2005 with the same section of the law that Pratt was charged with). You can see his profanity-strewn description of what he said happened to him, in this Facebook post. Pratt posted a $2,000 bond and was released at 3:35 p.m. He is scheduled to appear Tuesday, Sept. 4 in state Superior Court in Stamford. New Canaan police cited two teenagers from that town for infraction-level offenses midday Monday, Dec. 17 after finding them with alcohol and marijuana about a block north of the border with Darien, police said.